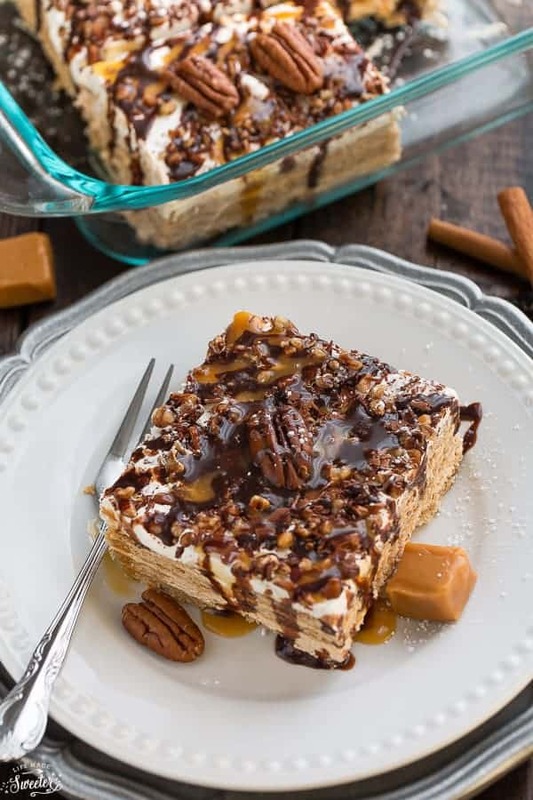 Easy No-Bake Turtle Icebox Cake is the perfect dessert to serve to a crowd. 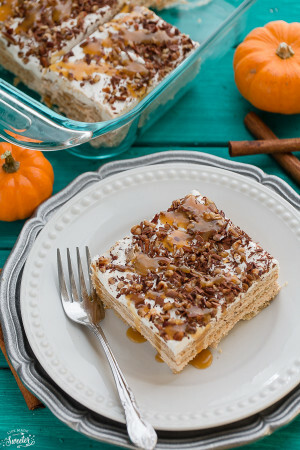 Best of all, takes less than 10 minutes to assemble with layers of graham crackers, caramel cream cheese mousse, chocolate and crunchy pecans! With all the festive holiday parties around this time of year, I thought we could all use a fuss-free dessert option to take along to a few of those dinner parties. 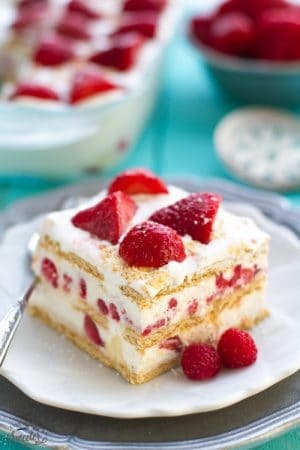 Icebox cakes are one of the easiest desserts I turn to whenever I’m pressed for time and don’t feel like turning on my oven. My strawberry, peanut butter and pumpkin icebox cakes have all been a hit so far and I couldn’t wait to share another one more appropriate for the holidays. It’s completely no-bake so you can leave your oven free for the big bird (or ham) and it’s really easy to put together! 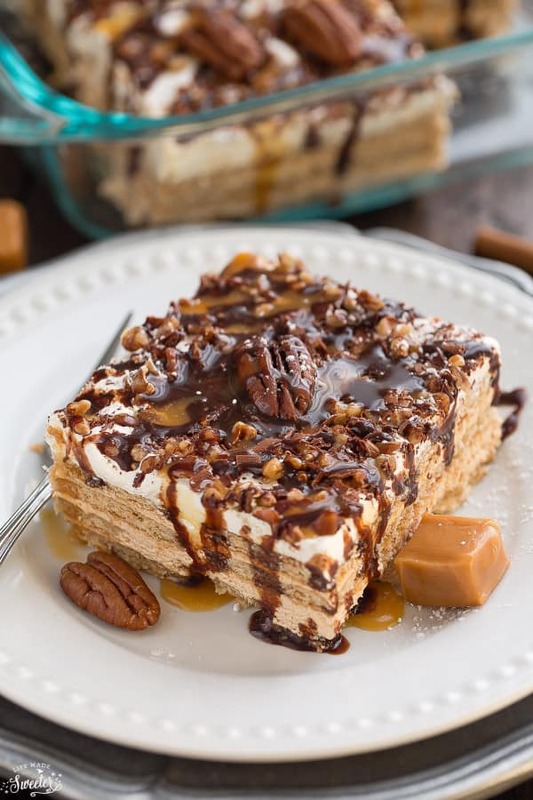 This icebox cake starts off with graham crackers that become soft and cake-like when layered between a caramel cream cheese mousse that’s made with whipped cream, cream cheese, and caramel sauce. The cake is then topped with shaved chocolate, chopped pecans, a drizzle of chocolate and more caramel sauce plus a sprinkle of powdered sugar. It’s creamy, a little crunchy and absolutely dreamy! The hardest part is just waiting for all the layers to set and the flavors to meld together. The make-ahead option makes it easy to put together the night before company arrives or if you plan on bringing it along to your next holiday shindig. 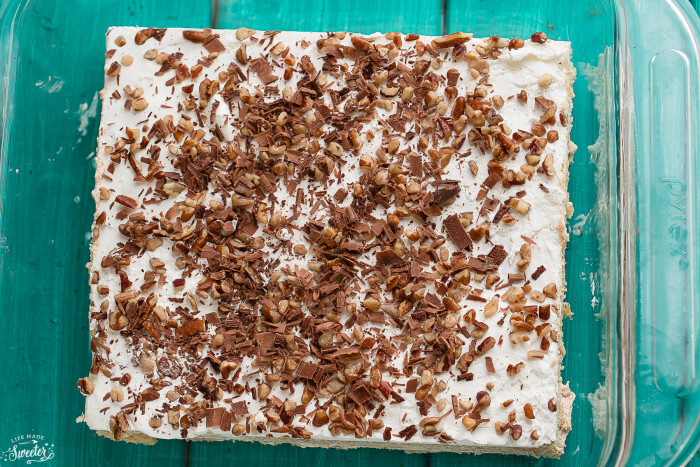 Easy No-Bake Turtle Icebox Cake is perfect for the holidays! 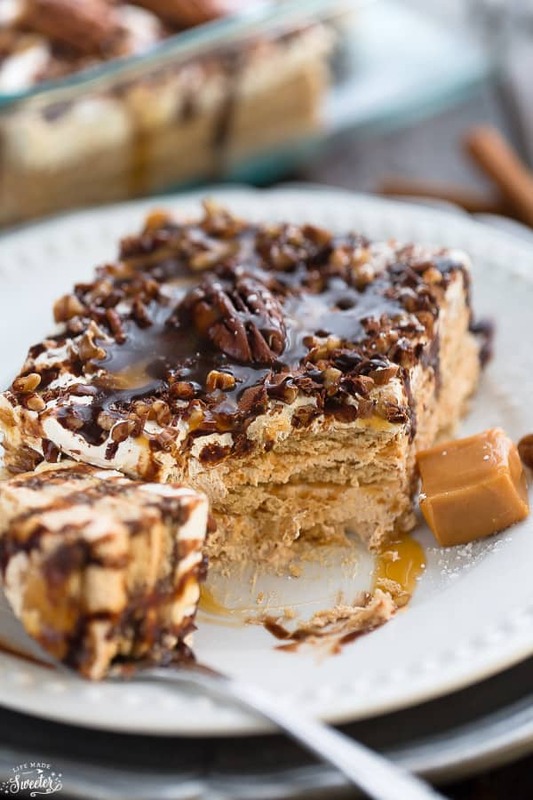 Made with graham crackers between layers of caramel cream cheese mousse, chopped pecans and a drizzle of chocolate and caramel sauce. *To make freshly whipped cream: With a hand mixer or in the bowl of a stand mixer, whip 2 cups of heavy cream until it just holds soft peaks. Add 1/3 cup of powdered sugar, 1/2 teaspoon of vanilla extract and whip to combine until stiff peaks form. Do not overmix. Make the cake:Beat the cream cheese and caramel until creamy. Fold in 3 cups of freshly whipped cream or Cool Whip. Spread a thin layer of the cream cheese mixture in a 8 x 8 pan to coat the bottom. Place 3 graham crackers across the center of pan and then break up 1 or 2 more crackers as needed to fill in the gaps. Spread half of the cream cheese mixture on top. Top with another layer of graham crackers, breaking them as needed to make them fit. Spread the remaining cream cheese mixture over the top. Arrange the final layer of graham crackers. Spread the reserved 1/2 cup freshly whipped cream (or Cool Whip) over evenly. Refrigerate for at least 4 hours or overnight until the graham crackers have softened completely. Prior to serving, drizzle with chocolate and caramel sauce and sprinkle with powdered sugar if desired. Serve chilled.